We are excited about the events we have had the privilege of being a part of this past month. We continue to reach out and actively participate and partner with organizations not only in our community but across the country to actively inspire hope and vision for Native American youth. To start off our busy summer schedule, our ambassador, Kansas Middletent, had the opportunity to travel to Boston and present “The Untold Story of Native America” to the Rotary Club, a young group of working professionals who are actively involved in their community. The event came about due to their interest and excitement to learn more about the Native American culture and community. A small one-hour intimate event in the home of one of the community members turned into a three-hour event of open conversation and eagerness to learn more about the struggles facing Native Americans today and how they can join this movement. The Crow Creek Sioux Indian Health Service hosted their annual community health fair to honor life, create awareness, and to inform others of healthier living alternatives. Tribal Programs, partner organizations, and community members know the significance of this event and the powerful message this event promotes, providing community members with resources and programs that are available on the Rez and new alternatives to the resources they might already have or can easily access. The day commenced with community members registering for the events and activities, as well as giving a blessing over the oyate. After the blessing, community members got to visit booths, receive basic health services, sign up for raffles, and learn about what they have available to them. There were 12 booths and Native Hope was one of them. We told adults about the opportunities our Leaders’ Society provides for the Native Youth and how our vision and mission make it all possible. We also shared our content and videos for positive mental and emotional health. We also discussed the power of family and why it’s so important to restore that kind of health back into our lives. The day ended with an honor song: thanking all those who came to help the oyate. This past June, Kansas and Kyal Middletent, Native Hope staff, both volunteered at the O.C.E.A.N. Sports Camp. The camp is focused on “Fighting Obesity through Community, Education, Activity, and Nutrition,” and is in partnership with the Lower Brule Sioux Tribe & Fire Cloud Enterprises. 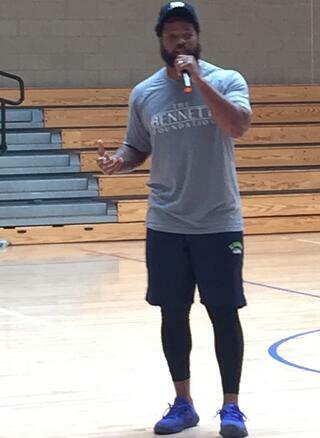 A highlight of the camp was special speaker Michael Bennett, Pro Bowl MVP and NFL Super Bowl Champion from the Seattle Seahawks. Bennett and co-founder Tristan Fire Cloud from the Lower Brule Sioux Tribe organized the event together to promote nutrition and physical fitness, focusing on positive ways to live a healthy and active lifestyle for the whole family. Tristan says, “I was surprised we had such a good turnout. I was expecting less than 100 people and thought the bulk of them would be in high school. Then we had over 200 people and most of them were elementary/middle school students with their families, which was our goal! We wanted a family event so we could let our nutritionist speak to the parents and the kids. In addition, any time families do physical activities together it just seems like more fun and not a workout." The camp was a success! Tristan hopes to continue to bring positive events to the Rez. He states, "We might make the camp an annual event, or we might mix it up a bit so the people don’t get bored. We would like to promote family, education, healthy lifestyles, and nutrition. And I have a million and one things I’d like to see happen, not just in Lower Brule, but Native country in general." Without the generous support from The Circle of Hope, we wouldn’t be able to promote our mission and our work with people in our community and all over the country. Our Circle of Hope continues to grow, enabling all of us to offer hope and opportunity to Native American youth.